Auto repair financing is one of the most frequently discussed topics here at our repair shop. That’s because even with the best planning, sometimes vehicles give our customers unpleasant surprises. In fact, these surprises could leave them without wheels or financially strapped. We know that you depend on your car for everything – for your family, your job, and your life. That’s why Good Works Auto Repair has partnered with GE Capital and EasyPay Finance to give you options, and take the burden out of keeping your car on the road. When your car needs a major repair, it’s often not a repair that can be completed in phases. 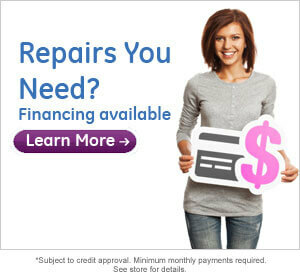 Our auto repair financing programs let you get that fix taken care of now, even if you have little or no credit. Then, you can make payments on auto repairs that will keep you on the road and your finances intact. We make it easy – from getting the auto repair financing set up, to control of your account – all from your computer, smartphone, or tablet. There is no need to download anything – simply click a financing option below and fill out the form to qualify. Need this credit? Click on the Learn More icon here. With EasyPay, you can get an Instant Online Credit Decision, no pay stubs or bank statements required, and same day funding available! Easily submit your application via online or mobile. Just click on the EasyPay icon and go!